From the Old Louisville Information Center building in Central Park, exit east onto Magnolia Avenue. Turn north onto Second Street and park. See area map. It is Easter 1887 and newly-found, gaily colored eggs are now nestled in woven baskets filled with grass. Recently exchanged Easter cards are carefully put away for future reading. The thoughts of children and adults are turning toward a special event that is to take place in their neighborhood today. The congregation of Cumberland Presbyterian Church at Second and Oak Streets has invited all area residents to attend a special Easter Sunday service, beginning at 8 AM to allow visitors to move on to their churches afterward. The Mivelaz family has donated biscuits baked at its fine dining establishment. These biscuits, Mrs. Forester's homemade blackberry jam, and Mrs. Crader's freshly-brewed coffee and tea will refresh the worshipers after the service. There are Mr. and Mrs. Fontaine Fox turning the corner with some of their neighbors from Brook Street. Emily Davison is in the choir loft preparing to sing her well-known rendition of "The Lords Prayer." If we hurry, we can catch up with the Mendel family, dressed in their Easter finery. But wait, take a minute, and look around you. You can almost hear an orchestra playing "Easter Parade" as the churchgoers walk down the street in silk top hats, leg-o-mutton sleeves, lace over muslin pinafores, and little-boy sailor suits. Well, the Mendels are already crossing Ormsby Avenue. It's too late to catch them. We can at least walk down Second Street and view their beautiful house at 1374. The walking tour begins on the west side of Second Street, north of Magnolia Avenue. From 1374, walk north to Oak Street. Charles Mendel, V. President, Kentucky Jeans Clothing Co. The original roofline was above the second story, and a wooden cornice was over a one-story porch. In the 1970's, an owner constructed the brick wall, removed the original front door, and gutted the building to begin renovation. Current owners have completed renovation. The original construction cost was $7,200. The dwelling was tenant-occupied until 1913. The ornamental carving beneath the eaves adds facade enrichment. Note the unique triple-window repetition on the first, second, and third floors. The design includes two bay windows and a third-floor balcony, with an intricately carved gable. This dwelling was once considered the worst rooming house on the block and was a lucrative bordello before its renovation in 1975. It is now a single-family home. The window in the stairwell is an outstanding feature. A previous owner planted dogwood trees to provide a canopied archway to the front door, reminiscent of Victorian England. The entry is recessed behind the round arched opening with stone arches. The outstanding architectural feature is the roofline. Charles and Emily Davison purchased the house in 1895. She was a prominent opera singer and socialite. Note the third-floor, single-story porch, or "widow's walk," and the fleur-de-lis design in the stained glass windows. This design is repeated on fireplace tiles inside the house. The interior woodwork, moldings, and staircase are hand carved, with many elaborate details. This is a four-story, one-family dwelling. The first floor has a butler's pantry and the second floor a linen press. There is a division between the servants' and residents' living quarters, made by separate, ornate stairs and doorways for the residents and plain ones for the servants. The brick sidewalk you are standing on is the only remaining section of the original Second Street sidewalk laid in the 1890's. The French eclectic/ mansard roof is rare in Old Louisville. 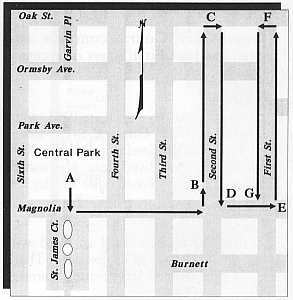 At the Oak Street intersection, cross over Second Street and walk south along the east side, back to Magnolia Avenue. Admire the rose window that faces Second Street. The Oak Street section was added in 1920. Dismas House is a "halfway house," a correctional facility operated by the Knights of Columbus since 1964. Owen Tyler, part owner, Building Supply Co.
A definitive Shingle Queen Anne, this structure could transport one back to "merry ole England." Special features are the stained glass transom and the pyramidal roof. Note the sunburst design near the roofline. The arched windows define this building's Romanesque style. The restrained use of stained glass and rustication acknowledges this dwelling's late Victorian heritage. M.H. Flarsheim, a clerk, lived at 1315. W.P. Lee, a collector, lived at 1317. J. J.. McCombe, with Averitt Tobacco Company, lived at 1319. The house was converted from a duplex to a single family dwelling in 1977. The kitchen and bathroom floors were recycled from a remodeled high school gym floor. The porch was added in the 1920's. This structure once contained 11 apartments. Its features are beautiful parquet floors, an original fresco ceiling, a carved mantel agate insert of tiger maple. Each formal room was finished with a different type of wood. This structure is typical of the medium-scale dwellings found along First and Second Streets. Featured is a beveled glass window transom, floors inlaid in quartered oak, and fireplaces with "mantel peering glasses," or mirrors. Backyard landscaping includes Victorian period shrubs. This dwelling has eight original art glass windows and six fireplaces. The house was deeded to Sallie 0. Holmes, wife of C.L. Holmes, "to have and to hold free from control of her husband." A greenhouse window off the kitchen and five art glass windows catch the morning sun. The leaded glass windows were added in 1979. Featured are iron and slate mantels, painted to resemble marble, and several original art glass windows. The three-story brick structure has a recessed entry, and the window openings are arched with brick voussoirs. The dwelling has a Palladian window in the front and a four-sided convex tower. Notice the decorative sidewalk posts in front of the house. Such posts were used to mark property lines in the nineteenth century. At Magnolia Avenue, turn east. Cross over First Street, then walk north towards Oak Street. To visit Ouerbacker Court, continue east on Magnolia Avenue, just past First Street or access Court from First Street. Ouerbacker Court was developed in 1912, with 1378 being the first house built. One-and-a-half story brick bungalows are typical of the dwellings found in the Court. Fontaine Fox, an attorney, lived here. His son created the syndicated comic strip "Toonerville Trolley." Victoria Gardens was purchased in 1976 with the intent to renovate documented in the deed. These four structures make a significant architectural statement on this block. The first floor windows have a stone window hood. A pair of arched brick lintels spring from an engaged column that separates the two arched windows on the second floor. A frame bay window on the second floor is supported by the first floor porch columns. Four square windows on the third story are separated by engaged columns. The three-story brick and stone residence combines the Second Empire style reflected by a conical roof on a turret, a pair of Gothic Revival windows on the second floor of the turret, a Palladian window in a gable next to the conical roof, a recessed Romanesque window on the second floor beneath the gable, and a circular window with a carved wooden insert. This is a representative of the architecture of the area in the late nineteenth century. The small lot size dictates the facade width, and the height is enhanced by the Victorian style. The shingles and roofline make this an identifiable Queen Anne. Built originally as rental property, among the early tenants were a bookkeeper, an insurance salesman, and a ladies' tailor. The small glass window to the left of the beveled glass door adds further facade enrichment, as does the marble sidewalk. The hitching post is another interesting feature. The entry on the left is set behind a stone arch, which has carved ornamentation. A stone band-course articulates the first and second stories. The decorative windows emphasize the symmetry in the building's facade. At the Oak Street intersection, cross over First Street, then walk south along the west side of First Street back to Magnolia Avenue. Features include fish scale shingles, a stone band course on the second story, and a bay with a tower-like appearance. The porch has fluted Doric columns which shelter the transomed door on the right. The left bay has an oriel window with incised stone linters and brick corbeling below. The decorative pediments are made of wood. A full, classical porch with Ionic columns and a lintel table extends across the first story. The third story windows are capped by incised stone lintels. Mr. Forester was proprietor of a wholesale sash, door, and blinds company. This double house has a simple cornice and two large windows flanked by double doors. John F. Speed, a U.S. tax collector, was the first occupant, renting 1238. Charles Ryan resided in 1240 and clerked for the Chesapeake & Ohio Railroad. These identical houses are the oldest on the block. They have first floor bay windows and tall, slender windows on the second floor. The third floor windows are outlined with brick corbeling. In the gable is a round window, and the cornice is lined with brackets. The first occupants were W.A. Tappan, a travel agent who owned 1330, and A.E. Rangers, an auditor who owned 1336. Outstanding features are the buff brick, inlaid mosaic, decorative fish scale shingle, and the Greek bay rakeboard. The house is situated on an unusually large, fully landscaped lot that also includes a driveway and garage. The classic front porch spans the main facade, which is punctuated by oversize double-hung windows, and a pair of etched double doors. Christian Stege, President, Distillery and Saddle Co. The embellishment of the ironwork and the inviting yard make this a very appealing home. The texture and color of the brick and the decorative banding between the first and second floors define the architectural style. The second-floor porch is this dwelling's outstanding feature. The tour ends at the intersection of Magnolia Avenue and First Street.